In April 2018, a national seminar was held to mark International Traveller and Roma Day. This seminar provided a space for dialogue between Traveller and Roma leaders, policy-makers and other human rights experts. The key message from the day was that discrimination and racism towards Travellers and Roma is endemic, and can be seen in unequal outcomes in health, education, jobs and accommodation. Audio clips of the speakers and panel discussions are available below. The day began with a welcome from Tica Muntean, Roma Community Worker at Pavee Point, followed by the Opening Address from Anastasia Crickley, the Outgoing Chair of the United Nations Committee on the Elimination of Racial Discrimination. Rosaleen McDonagh, Playwright, Regular Contributor to Sunday Miscellany RTÉ Radio One, Journalist for the Irish Times, and PhD Candidate at Northumbria University, shared her poem ‘I’m an Unsettled Woman’. Dr. Ethel Brooks, from the Departments of Women’s and Gender Studies and Sociology at Rutgers University, delivered her keynote speech ‘Bringing Human Rights Home – An intersectional perspective’. In the first panel, four speakers spoke about Traveller and Roma experiences of racism and discrimination, in Ireland and across Europe. Iaonnis N. Dimitrakopoulos from the European Union Agency for Fundamental Rights delivered a speech entitled ‘Discrimination against Roma and Anti-Gypsyism across Europe’. Following Ioannis, Dorothy Watson from the Economic and Social Research Institute presented ‘A Social Portrait of Travellers and census data’. In the second half of the panel, Gabi Muntean, Community Worker in Pavee Point, spoke about ‘Experiences of anti-Roma racism’, and Pavee Point Co-Director Martin Collins concluded the presentations with a speech on the ‘Normalisation of racism towards Travellers and Roma’. 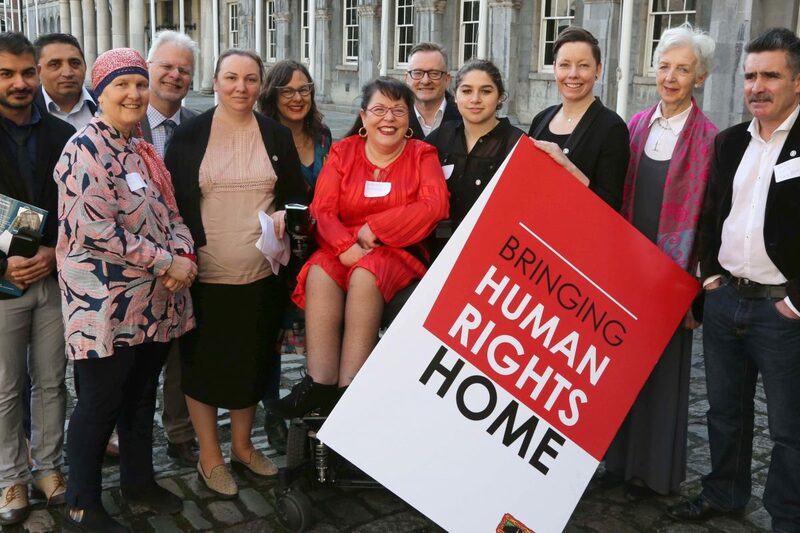 In a discussion chaired by Morning Ireland presenter Audrey Carville, Traveller and Roma representatives shared their experiences of human rights in reality. The discussion included Missy Collins and Gabi Muntean from Pavee Point, Alex Petrovics from FDYS Wexford, Michael McDonagh from Meath Travellers’ Workshops. In this panel, experts from Ireland and Europe shared their perspective on current Traveller and Roma strategies. Speakers included Dr. Bernard Rorke from the European Roma Rights Centre, Dr. Carol Baxter from the Department of Justice and Equality, and Ronnie Fay, Co-Director at Pavee Point. To wrap up the day, Emily Logan, Chief Commissioner of the Irish Human Rights and Equality Commission delivered the closing address, and singer Selina O’Leary performed ‘Wexford Town’. Thank you to all the conference sponsors, participants, and speakers.